You really CAN make artisan bread in 5 minutes! Our farmer’s market season is coming up in a few weeks, and I’ll soon be forced to dust off my skills in organic vegetable growing and artisan bread baking. My mom, my daughters and I make enough baked goods to fill several tables at our weekly market, and I get asked quite often how we manage to make so much. “Do you make this stuff all week?” a person will invariably ask, “How old is all this stuff?” suspiciously poking and prodding, to judge how fresh the breads and pies are. That always gets them. “Fresh? Still warm? Oh my!” What is about fresh warm bread that is so appealing? Is it the wondrous scent or the steamy promise of goodness, or the fact that it’s just not easy to get warm bread these days? Even if you go to a bakery (here in Nebraska) the bread generally is allowed to cool before it’s wrapped up and put out for sale. 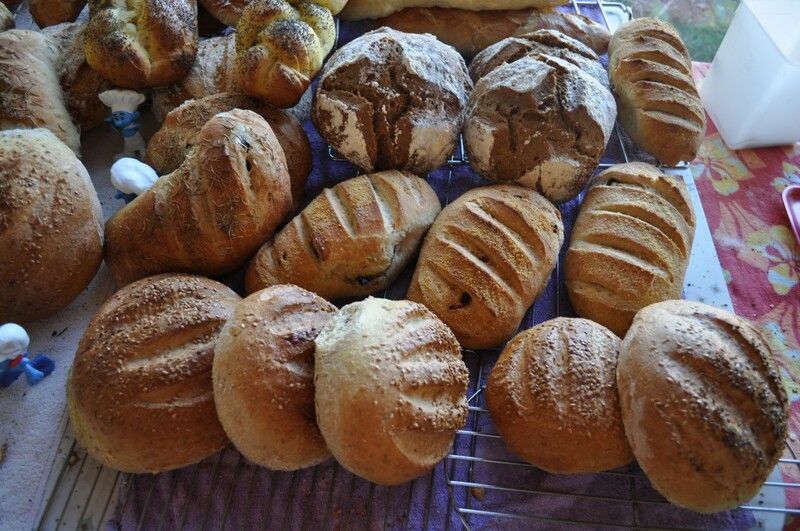 All these breads and more can be made with the “bucket dough” method! Here are several varieties, including German rye bread, sundried tomato and parmesan cheese bread, mocha and honey bread, and braided challah. Perhaps the only way to get fresh warm bread at your house, Gentle Reader, is to make it yourself. And that can be done. Did you know that there have actually been studies done that suggest that the scent of baking bread will make people kinder toward each other? (It’s a little hard to believe that people take time to study such things, but oh well.) I wrote about it in this blog post. I included an easy recipe for Chicago Wheat Bread in that post, too, if you’re so inclined. But back to the “fresh warm bread” you can make yourself idea. I almost feel guilty (almost!!) when people go into such raptures over my bread, because I use a method that is incredibly easy. I call it my “bucket bread” method. I got the idea from Jeff Hertzberg, M.D., and Zoe Francois, who wrote a book a few years ago entitled “Artisan Bread in Five Minutes A Day.” There’s an excellent website where you can buy this book, watch a video about how to make this artisan bread, and lots more. You can see a recipe and pictures of the cute little bunny rolls that my sister made for Easter dinner there, too. In fact it was my sister Mollie who turned me on to the bucket bread method years ago. I was making 60 to 70 loaves of bread for market every week, and it was killing me. Well, not exactly killing me . . . but it was tiring me out, baby. My hands hurt from all that kneading. It was exhausting. My sister was also making bread for farmer’s market that summer, many more loaves than I was, and yet she seemed always fresh as the proverbial daisy about it all. I asked her how she was doing it. She was using this method to churn out nearly 100 loaves of bread every week, with no kneading, and her bread was absolutely beautiful. I was a convert. I bought the book, I studied the website, I purchased a few pieces of essential equipment, and I soon was making more bread in less time . . . and without kneading. Are you ready to try this? If you’ve never made bread before and are intimidated by the whole process, this is for you. If you’re a seasoned bread maker and want to try something new and fun, this is for you. You really CAN make artisan bread in 5 minutes a day. Let’s get started, okay? There! (cymbal crash!) Are you not amazed? Are you not ready to do this thing? So little equipment + so few ingredients = bread that anybody can make. Even me. Even you! 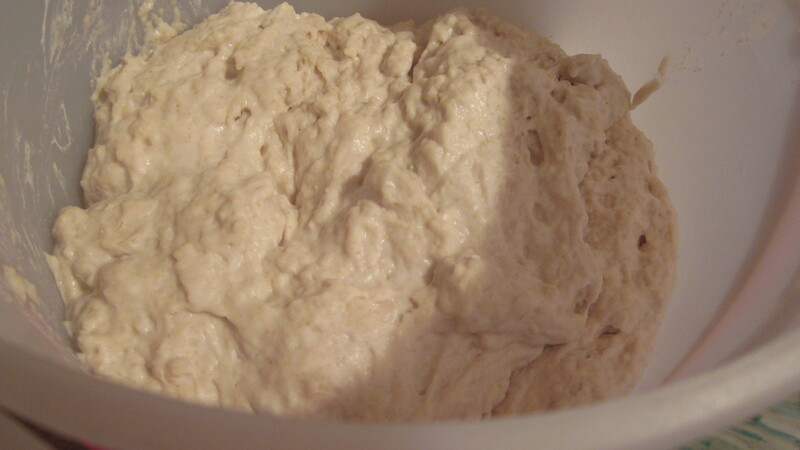 Here’s my dough, freshly mixed and beginning to rise. 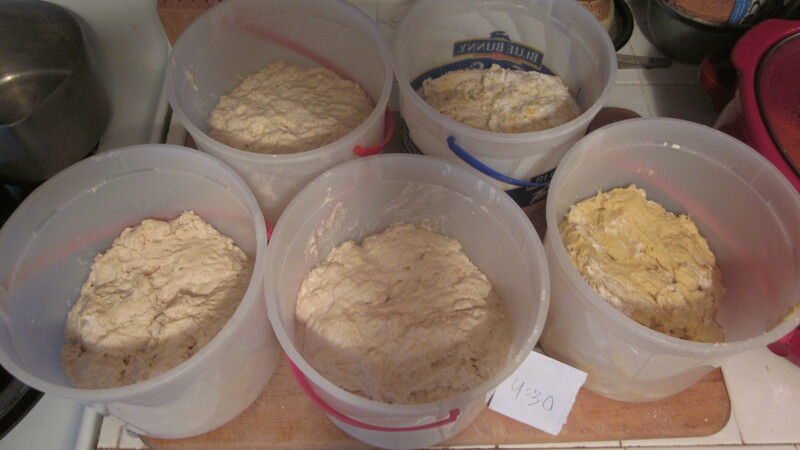 It is a wetter dough than traditional bread dough, but don’t panic. That’s the way it’s supposed to be. After the dough has reached the top of the bucket (it takes two hours or less) and begins to collapse, you cover it loosely with a lid or plastic wrap, and sock it into your ‘fridge for an hour or two. (You can use it right away after the initial rise, but it’ll be soft and kind of temperamental at that point.) You may go take a nap now. I make several buckets full of dough at a time, because that’s how I roll. In these buckets I have an eggy dough which I’ll make cinnamon rolls with, cheddar cheese bread dough that I’ll make today, and three buckets of light whole wheat dough, which I’ll make into my family’s favorite olive bread, pizza dough, and some plain ordinary whole wheat bread, over the course of the next week. It’s like money in the bank, friends, to have all this dough at the ready! When you get up, you dump your dough out onto a floured board and cut it into four equal portions. Don’t you dare knead it! Save those lovely hands for soothing fevered brows, or playing a Mozart sonata on your grand piano in the next room. Don’t knead. Decide how many loaves you want: if you just want one loaf, shape it quickly and set it on a cornmeal-dusted pizza peal. If you want four loaves (and I always do) shape them and place them on a parchment paper-lined cookie sheet. Now you’ll go sit down and play checkers with your son who has been begging you to do this, while your lovely loaves rise. You’ll need to preheat your oven during this time (excusing yourself just momentarily from your chummy checkers game) and though it’s a bit of trouble, you’ll also place a pan full of hot water on the bottom rack of your oven. This is going to create, along with a very hot temperature, a steamy sauna for your bread dough that will make the nicest, crackliest crust that you can imagine. So do it, chickie. It’s worth it. When the loaves are ready, you’ll sprinkle them with flour and slash them with a sharp knife (don’t be afraid!) and then sprinkle them with shredded cheese, that is, if you’re making cheese bread which today–I am. Here’s my cheddar cheese bread loaves, all finished rising and ready to go into the oven. Now (prepare yourselves!) you’re going to have to do something rather frightening. But I know you can do it. You’re going to take your pizza peel, or your cookie sheet, whichever, and open the oven door (be careful! It will be full of hot steam and can burn you!) and quickly slide the bread loaf (or loaves) onto the pizza stone that is waiting inside, nice and hot. It takes a bit of a jerk of your hands to do this, and you may think that you’re going to ruin your lovely loaves, but don’t worry, you won’t. You’ve done it! Now you can clean up you mess while your bread bakes, or you can go work on that Mozart Sonata for a half hour, and then you’re going to pull your artisan bread out of the oven and you’re going to just get out of the way. Cos there’s gonna be a stampede, and you can just modestly stand aside and wipe the flour off your brow and bask in the happiness and the glory that will be yours. Here’s my batch of cheddar cheese bread, fresh and hot out of the oven! You’ve done it. You’ve made artisan bread in just a few minutes of effort. If you do decide to make this bread, I highly recommend that you go to the website I mentioned above and enjoy a bit of time familiarizing yourself with the “bucket bread” method. That’s a great website, with links and hints for buying equipment, lots and lots of recipe variations, and even a video of how to make the bread. 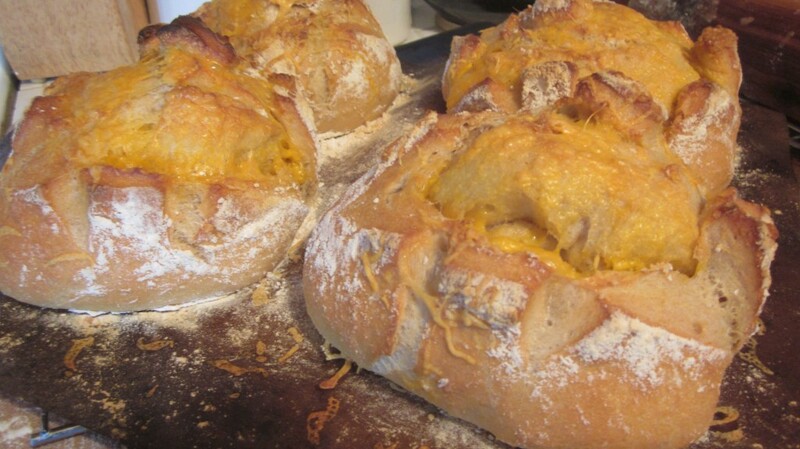 Here’s my recipe for cheddar cheese bread, in printable format. You really CAN make artisan bread in 5 minutes today! You'll need only a few ingredients to make a crusty, steaming loaf that will make anybody happy. Mix the water with the yeast, salt, and sugar in a lidded food container. 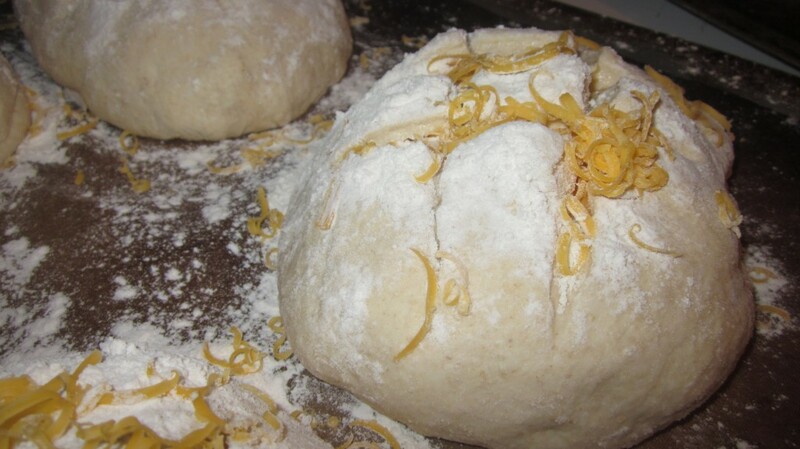 Mix the flour and the cheese without kneading. The dough will be wet. Cover (not airtight) and allow to rest at room temp until the dough rises and collapses, approximately 2 hours. Shape into loaves right away, or refrigerate and use within 7 days. Allow loaves to rest for 1 hour for refrigerated dough, or just 40 minutes if you're using fresh, unrefrigerated dough. minutes before baking time, preheat oven to 450, baking stone on a low rack, empty boiler tray or shallow pan on a lower rack or the bottom of the oven. Sprinkle loaves with flour and slash with a sharp knife. Slide loaves directly onto the hot stone. Pour 1 cup of hot tap water into the broiler pan. Bake for about 25 minutes or until deeply browned and firm. Allow to cool on racks before slicing or eating--if you can get away with that! Now go have fun and bake some bread! If you enjoy this whole process, I would certainly recommend your buying the book Artisan Bread in Five Minutes a Day. There are lots more recipes in that book, as well as lots of handy tips and gorgeous photos. You’ll love it! I am off to pick up my bucket with free ice cream IMMEDIATELY to do this…wait…I saw 4 buckets…4 ice creams!! I can’t WAIT to try this method – hugs! Thanks Carrie, you’re so sweet, and enjoy that ice cream and when you’re hungry again, you can make bread. Cheers, chickie! Yes Gwynne, buy some yeast and let me know how the bread turns out! Great, inspiring recipes. I hope some of your readers try these. I heard that the reason the smell of warm bread makes people more agreeable is because baking bread together is one of mankind’s earliest memories. There’s something very appealing in this thought. I love this thought, Francene! Thanks for sharing it with me. I used the wrong url above. Thanks again for a great post. I can smell bread baking from here. Thanks Wendy! Glad you enjoyed the recipe. No Need To Knead…I love it. And I must mark this page so I remember to bake some as soon as I get home (where it just happens to be snowing this morning and they are under a flood watch for the next two days, one of the rivers is cresting at 11 feet) I love home made bread, and would like to make it for our farmers markets but Wisconsin won’t let us sale food at the fairs unless we can prove it was made in a professional kitchen. I would love to do pies, tarts, and bread if I could get around this law. Thanks for all the leads, I may just find a way to do it. The FDA does not have a problem, it’s the dept. of Ag. because they want to charge you $375. for a permit. I’m so sorry that the FDA is so problematic with its onerous laws. Hmph. We are allowed to do baked goods in our non-commercial kitchen as long as we post a sign “All Baked Goods prepared in NON-INSPECTED kitchens.” (How’s that for a turn-off??) All our customers are smart enough to know that it’s buyer-beware and they trust us, though our kitchens are not commercial. Mmmm, I think I can smell it, too Janelle–is it in your oven yet? Oh wow I love this and I love the cheese bread. Fantastic and I am going to make it soonest, once the kitchen is finally unpacked ! Anita-Clare, let me know how it turns out for you! 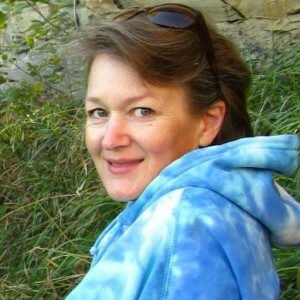 Stopping in from the Ultimate Blog Challenge. Reminds me of when I baked bread with my grandmother. I loved the smell of the dough. This sounds like a good excuse to go out and buy a big bucket of ice cream! Wow, sounds wonderful Amy, I will have to give this a try when I have a spare 5 minutes. I like to make beer bread – it has 4 ingredients – self-rising flour, warm beer, sugar and butter. You can use any flavor beer and add anything you want from nuts and dried fruit to a chopped olive mix, make jalopena cheese bread, or anything else your imagination can conjure. and it only takes a few minutes to mix and 90 minutes to bake. Your bread looks wonderful and I would buy your loaves if I was anywhere near Nebraska. Julie, I’ve made that beer bread, too, and it’s delicious and makes the house smell so good, doesn’t it? Thanks so much! Lovely! Right up my alley as well. I do a lot of artisan bread, in fact today I’m doing the 18 hour bread. Thanks for sharing! Hooray! I’d love to hear about 18-hour bread. If I made your bread, what would the local person I sometimes buy bread from think? (small, local farmer, too). 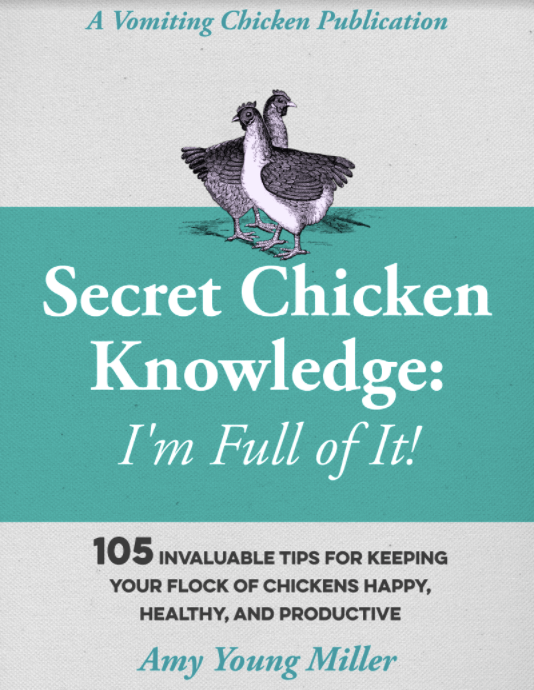 Seriously, now I may know some of her secrets! She makes such a huge variety of breads… My stomach is rumbling over that cheese bread, although I am not a big bread eater anymore. I think that could easily be adapted for Weight Watchers. I pinned this post, too, for my Pinterest followers. Thanks so much, Alana! Here’s what you do: buy from your local baker during farmer’s market season, and make your own during the off-season? Lots of happiness in that bread! Let me know if you give it a try! Oh, oh, oh, Amy, you are FABULOUS!! I LOVE bread! Thank you so much for the recipe. These look delicious! I am going to give this a shot & report back! Oh Shelli, thank you! Please do try this recipe out and let me know how it goes for you! I’m drooling, I can smell that bread! Not baked bread in years – it doesn’t fit in with my chuck it in a pan and see what comes out style of cooking. Enjoy your free ice cream, Jan, and then you’ll be all ready to make some fresh bread! …there is nothing quite like home-made bread! I love bread and am always on the lookout for easy recipes. Is there an alternative to using the pizza/baking stone in the oven to put the bread onto? I don’t have one 🙁 Could you just put the baking tray into the oven to heat up? Yes, you can put the cookie sheet in the oven instead of using the pizza stone, but you won’t get the really nice bottom crust. It’ll still be delicious though, I’m sure. 🙂 I bought a pizza stone at our thrift store for $2.00 a few weeks ago, so you might want to keep a lookout for one at a second-hand place. Many people don’t realize how handy they are. THanks for the tag, Chef! I loved the post! Amy, question…what is the whole wheat ratio in this bread to consider it (whimpy wheat) whole wheat bread? Would 2 c. whole wheat to 4 1/2 all purpose work? How many eggs for egg bread? Sorry for all the questions. I’ve made this before but, whole wheat as we know, didn’t rise very well. Tks in advance. Rose, I think that would work. I’m not sure about your question about the eggs though. I don’t mind questions at all, but I’m not sure what you’re asking? As far as the whole wheat ratio goes, I just experiment! I know that 100% whole wheat in this bread makes a sort of flat bread that I wasn’t crazy about. I like my breads to have a nice rounded shape. Sorry, my bad re: egg bread… I’ve been looking all over for a 1.5 gallon container and they are crazy expensive online! Your idea of ice cream containers is brillant however, I can only find 1 gallon containers of ice cream. Will a whole recipe rise all the way to the very top or will it overflow w/ the gallon one? By the way, I LOVE dipping this bread in olive oil w/ herbs, S&P etc. Restaurant style! I have always baked mine in a dutch oven but am interested to try your way! Tks! We can still find the 1.5 gallon ice cream buckets at the bigger grocery stores: bigger Wal-Marts and HyVees have them. That’s all I use. Although our little pizza restaurant in town will save buckets for me. Have you asked around at your restaurants? I did it!!! I made 2 loaves!!! I made some Carrabba’s Italian EVOO dip to go with it…sooo good!! Mine weren’t as pretty as yours but I think is what happened is when I tried to score the top w/ a serrated knife, I popped it. 🙁 ah, poop) Do you use a razor to cut top? Oh well…onward, next up, olive bread! Keep giving us more!!! I want to try them all! Tks!! Good for you!! See how easy it is? Be sure to check out the Artisan Bread in 5 website (http://www.artisanbreadinfive.com/2014/07/28/doughnuts#more-7038) for lots more recipes and tutorials and whatnot. I use my sharpest serrated bread knife to cut the slashes in the top. You may have let yours rise too long? Just keep baking it, you’ll learn more with every batch! Hi all, I guess you guys all have lovely American fridges! I’m writing from Britain and space is rather tight. How big is the bucket? I don’t know if I’d have the space in height even if I could make space for the circumference. Thank you in advance. Hi Clare! The bucket is a standard 1-gallon ice cream bucket. But you can use a large bowl–or if space is especially tight, you can use any container that you can fit into the fridge. Note: The dough needs the larger bucket for the initial rise, but after it rises, then it sinks quite a bit. So after the initial rise, if you need to put it into a smaller container to fit into the ‘fridge (anything will do–I don’t know what you have available there, but I’ve used zippered freezer bags, even) you can. Just experiment until you find something that works best for you! It’s worth the trouble to have this dough in your ‘fridge, I promise! Thank you for your reply. I have bought a container like a lunch box and the lid clips down. I underestimated how much plain flour I had in the cupboard so I’ve used about a third wholemeal flour without the sweetening ingredients I saw when I read the wholemeal loaf recipe recipe later. I suppose I need to reduce the temperature a bit and bake a bit longer. I placed the lid without clipping during the rise but I think I should have let it breathe more. Now the dough has been in the fridge for 12 hours, it doesn’t look very different now to when I put it in there. It’s filling the 5l container and the air is visible. Is it OK for the container to be airtight while it’s in the fridge? Clare, yes, I think it’s fine for it to be airtight, as long as it has already done its rising on the counter, before putting it into the ‘fridge? It won’t rise much while it’s in there.